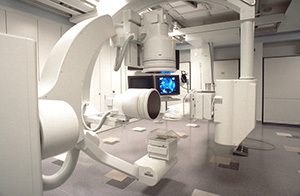 FCA provided full A/E service for the renovation of existing Cath Lab Room No. 2, 5 and 7 on the second floor of the Stanford university Medical center to accommodate new single-plane GE and bi-plane Siemens equipment. Each Cath Lab consists of a procedure room, a control room and an equipment room. Highlight of this project is the combination use of Siemens bi-plane imaging equipment with Stereotaxis magnetic navigation system in Cath Lab No. 5 which require not only the normal lead shielding for the walls but also magnetic shielding to all five sides of the room. The challenges are the support of heavy ceiling mounted imaging equipment from structural high above an interstitial space with catwalks crisscross the project areas. In addition, the floor below is over emergency department and cafeteria which are to remain in operation during construction.